Introduction - Honor and Feud. Among the Scandinavians of the Viking Age, honor was of paramount importance, both to the individual and to the family: "honor was a kind of equilibrium which a man could not allow to he disturbed. It was intolerable if you were not on even terms with society at large; if you and your family could be spoken of with scorn. Balance and good name were restored only with successful retaliation for insult or injury" (Foote and Wilson, The Viking Achievement , 428). þæt he Eotena bearn irne gemunde. cyning on corþre . . .
that was to the Jutes a sword well-known. cruel sword-evil at his own home. Limiting as a social mechanism. Since feud by its nature tends to continually escalate, involving more and more members of a society in its bonds of hatred and bloodshed, it is to the benefit of a society to develop limiting mechanisms to protect not only its individual members and families, but also the society as a whole from death and dissolution. "According to Járnsíða , feud should be eradicated because it robs society of its best men and the king of his best subjects .... This may be (the law points up the tendency in feud societies in general for retribution to fall not on the killer himself but on a member of his family), but it can hardly be the main reason for the suppression of the practice. In Iceland no less than in other feud societies, feud was a form of clan law and it was in the interest of the state and [later] the Church to reduce the power of the clan" (Clover, "Hildigunnr's Lament," 144). The dominant concern of Viking society as reflected in the sagas was "to channel violence into accepted patterns of feud and to regulate conflict', (Byock, Feud , 1). The first step in limiting feud is to narrow the circle of those directly involved in each battle. One way to do this is to develop the duel of honor between two men as a socially accepted means of redress for injury. 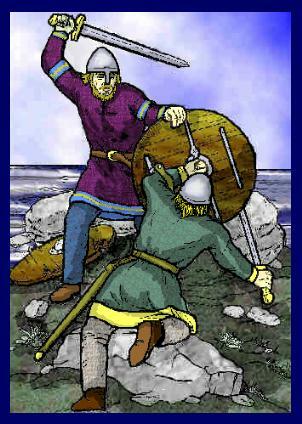 The Vikings called the duel einvigi; literally "single combat," but the concept was developed well before the Viking Age by their Germanic ancestors, for cognates appear in Old Swedish (einvighe), Old High German (einwic), and Old English (artwig), as well as in Old Norse (Bø, "Hólmganga and einvigi," 145). Einvigi was an unregulated duel, fought with any weapons, in any location and by any methods: in short, a brawl (Jones, "Characteristics", 217). The combatants in an einvigi duel had no judge, and there was no invocation of judicium dei; rather, they relied on their strength and personal "luck" to decide the matter. Ullr, we are told by Snorri Sturluson in Gylfaginning , was known as the god of einvigi; and might have been called upon by one or both contestants to grant divine favor for the fight, but there is not a single instance in the sagas or other Viking literature where any divine help or interference is described (Ciklamini, "Icelandic Duel," 181-182). For whatever reason, einvigi never developed the judicial and religious character of the duels in continental Germanic cultures, the wager of battle, for in general, the Vikings preferred to rely on their own luck and strength, not on a god's whim (Bø, "Hólmganga and einvigi," 135-137). Failures of einvigi as a limiting mechanism. While einvigi did restrict bloodshed to some degree, it was still not a certain shield against feuds. If one of the combatants were slain in the einvigi; his relatives were entitled still to eptirmál, the right of legal prosecution after killing (Jones, "Characteristics", 205), where the survivors might opt for vengeance or wergild for his death. While an offer to pay wergild legally obligated the avenger to stay his hand and give the slayer a chance at legal defense at an assembly, at the same time Viking culture was geared towards vengeance rather than atonement by paying a blood-price. The Gulaþing Law illustrates this attitude exactly: "Now no one, neither man nor woman, has any personal right to atonement more than thrice if he does not avenge himself meantime" (Foote and Wilson, Viking Achievement , 428). And, of course, vengeance was followed by vengeance, again escalating quickly into generalized feud. Thus, while insult was followed not by feud but by the duel of honor, the duel could easily only delay the onset of a feud, not prevent it. Further Limitation - the Development of the Hólmgang. A new type of dueling is developed by the West Norse. As Scandinavian society continued to evolve throughout the Viking Age, further mechanisms to control violence within the society were developed. Since the world-view of the pagan Norseman glorified the warrior, and promised a luxurious afterlife for those who died in battle, it followed naturally that for many the surest resolution of dispute would he by the sword. The duel of honor would remain a part of Scandinavian society, however in the West Norse areas (Norway and Iceland) a new form of duel evolved, known as hólmgang. While the einvigi persisted to some extent side-by-side with hólmgang, in Iceland especially einvigi became more and more rare. (At times in the later literature the two terms have become confused, using einvigi when the text's description makes it clear that hólmgang is what was meant). The hólmgang was still a duel of honor, fought between two men, but the hólmgang was different from einvigi in that it was associated with specific rules or customs known as hólmgangulog (literally, "hólmgang-law" or "hólmgang-rules"). The hólmgangulog was not a single, formally codified law, as the word -log would suggest, but apparently varied from place to place. A man uses an unutterable word to another:. "You are not a man's equal and not a man at heart." [He answers:] "I am as much a man as you." They are to meet at a place where three roads join. If the one who comes gave the insult and the other who received it does not come, then he will be what he is called: he cannot swear a legal oath or hear witness on the behalf of either man or woman. If be comes who received the insult and not the one who gave it, then let him shout three niðing-shouts and mark the other man in the ground. Let him who spoke what he did not dare maintain be so much worse a man in consequence. If they meet both fully armed, and the one falls who received the insult, atone for him with half-price for manslaughter. If he falls who gave the insult (the crime of words is worst, the tongue a prime slayer) let him lie in the valueless field [i.e. no atonement is paid for his death] (Foote and Wilson, Viking Achievement , 379-80). Kormáks saga . chapter 10. These were the roles for the hólmgang: a cloak five ells square was to be laid down, with loops in the corners. Pegs with heads were to be rammed in there which were called tiösnur. He who attended to this was to approach the tiösnur in such fashion that he looked up between his legs while holding onto his earlaps and speaking the spell which later was used in the sacrifice which is called tiösnublót. Three borders (or furrows), each a foot in breadth, were to be around the cloak, and at the edge of these borders must be four posts which are called höslur (hazels). And when all this had been done the spot was called "hazelled" (völlr haslaðr). Each contestant was to have three shields, and when they were destroyed then he must step on the cloak again if he had left it before, and defend himself with his weapons thereafter. He who had been challenged was to have the first blow. If one of the two was wounded so that blood flowed on the cloak, then no further fighting was to be done. If either one stepped outside the höslur with one foot, then that is called "he yields ground"; but "he flees," if with both. Each contestant was to have someone to hold his shield for him. He who was wounded hardest was to pay hólm-ransom (hólmlausn) -- three marks of silver (Hollander, Kormáks saga , 33-4). Moldi declared he would recite the law of wager-of-battle, "because I have challenged thee. Each of us shall spread his cloak under his feet. Each shall stand on his cloak, and not draw back a finger outside it, but he who does draw back shall hear a dastard's name. But he who goes forward shall be called a brave man wheresoever he goes. He that is wounded or rendered unfit for the fight shall ransom himself from the hólm with three marks of silver" (Jones, "Characteristics," 208). Egils saga Skallagrímssonar , chapter 64. It was dueling law at that time that if a man challenged another in any matter and the one who issued the challenge won the victory, then his due as victor was whatever the challenge bad been made for. If he were defeated, he was obliged to ransom himself by an agreed sum. But if he fell in the duel, the fight lost him all his possessions, and the one who had killed him in the duel inherited from him ( Egils saga Skallagrímssonar , 120). There are some other short accounts describing the rules of the hólmgang in sources such as Gisla saga Sursonar and Vatnsdælasaga , and these explicitly name a hólm or island as the location for the duel. While the accounts above seem very different, there are many common features of the hólmgangulog. All duels were conducted within a hólmgangustadr, a bounded area which was often on an island or hólm. It is likely that each district had its own dueling-place, where traditionally such battles were fought. The hólmganga in Kormáks saga were all fought on Leiðhólm (leið is a court), while hólmganga arising at the Alþing were always fought on the hólm in Axewater (Jones, "Characteristics", 213-214). Within this area was secured a cloak approximately nine feet square. A series of three lines was cut into the ground around the outside of the cloak, each a foot apart. It is interesting to note that the Old Norse term for challenging a man to hólmgang, skora a hólm: skora, "to challenge," means literally "to cut or to score," thus skora a hólm was "to mark out or appoint a place for the combat (Jones, "Characteristics", 213). Around these marks was a boundary of ropes and hazel posts (höslur) [ Kormáks saga ] or of stones (markasteina) [ Egils saga Skallagrímssonar ], and this boundary was called the hólmhring (Jones, "Characteristics", 216). Thus, the total fighting area was no more than about twelve feet square. The entire marked out area in which the duel would take place was called the hólmgöngustaðir, and served both legally and ritually as a court of law (Jones, "Characteristics," 214). Generally, each fighter would have an unarmed shield-bearer, who provided the duelist replacement shields as they were destroyed in the combat. The shield-bearer, or second, was probably not meant to take part in the conflict, but the saga descriptions show that they could certainly affect the outcome of a fight, or even carry it forward by challenging the opponent or the opponent's seconds after the first hólmgang was concluded. Each fighter struck a single blow in turn, with the challenged party delivering the first blow. Once a man's three shields were gone, he had to stay upon the cloak and defend by parrying with his sword: apparently running and dodging were not allowed as a part of a fighter's final defense. This give-and-take continued until one of the duelists was wounded, whereupon the shield-bearers and/or witnesses were supposed to prevent further combat [ Kormáks saga ]: many of the saga descriptions mention that the disabling wound was to the thigh or leg, after which the combat was stopped, even if the combatant wished to continue. The usual weapon for use in hólmgang was the sword. Experienced hólmgangumenn carried two swords with them, one in hand and another on a thong looped about the wrist, which not only gave the duelist a "back-up" weapon if his blade became dulled or broken, but an extra length of iron with which to ward off blows when his shields were gone (Bø, "Hólmganga and Einvigi," 144). The hólmgangulog apparently prescribed the use of a sword shorter than that usually used in war, for Þorkell complains in Kormáks saga that the sword that Hólmgangu-Bersi wished to use was too long (Bø, "Hólmganga and Einvigi," 14), and Halfs saga ch. 10 states that the proper length of the dueling sword is one ell (Bø, "Hólmganga and Einvigi," 144). The sagas rarely mention other weapons being used in the hólmgang: occasionally axes are named [ Kormáks saga and Olafs saga Tryggvasson ] and Egil Skallagrímsson once used a "halberd" in a duel ("halberd" is the translator's effort to describe a hooking-spear or slashing-spear, called krokaspjót in the sagas) ( Egils saga Skallagrímssonar , 122). Apparently fighting the hólmgang required skills different from those needed in war or other martial activities. Several men in the sagas seem to have been were frequent duelists, or even professionals who lived solely by dueling, as is indicated by the names Hólmgangu-Hrafn, Hólmgangu-Ljotr, Hólmgangu-Mani, Hólmgangu-Skeggi, Hólmgangu-Starri and Hólmgangu-Bersi (Ciklamini, "Literary Mold", 124). As one hólmgangumaðr recounts in Kormáks saga, "you have challenged me to a hólmgang, but I offer einvigi to you instead. You are a young man, and little tried, and there are points to be known in the hólmgang, but none at all in the einvigi" ( Kormáks saga , Ch. 10 ). Dueling injuries resulting from the hólmgang were often not fatal, as the hólmgangulog stipulates that the fight shall end when first blood drawn showed upon the cloak beneath the fighters' feet. Some of the types of dueling injuries even remind a modern observer of those suffered in much later period duels: there are several accounts where the winning blow was to the opponent's leg, one to a thumb, splitting the skin over the knuckle, one had broken ribs, another a broken shoulder, and one fight was ended when a shard of the victor's broken sword flew up and grazed his opponent's cheek (Jones, "Characteristics", 220). The skill and finesse apparent even from the limited accounts of hólmgang surviving strongly tempt the translator to call this type of fighting "fence." The hólmgöngustaðir, or area in which the hólmgang was fought, was very limited (twelve feet square), and the duelist could not readily utilize all of that: as Kormáks saga recounts, one was said to "yield ground" or "flinch" if one set a single foot outside the höslur, and to "flee" if both feet went beyond the boundaries -- and flinching or fleeing carried with it strong overtones of cowardice, the mark of the niðingr, which no honor-conscious Viking could ignore. The area was even more limited once a fighter's three shields were gone, for then he had to stand his ground on the central cloak (a nine foot square) and could only defend by parrying with his weapons. At the beginning of the hólmgang, both fighters were aided by a second, who stood close enough to the combat to protect their principal with a shield. 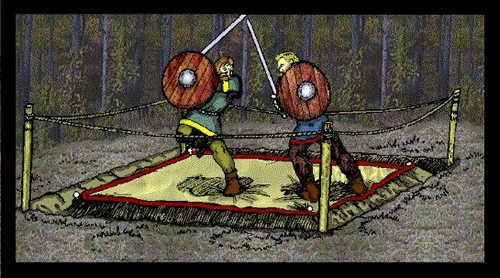 These shields cannot have been of very sturdy construction (we have accounts that shields were made of linden or basswood, a very soft wood), as the experienced hólmgangumaðr knew his best strategy was to quickly destroy all three of his opponents' shields: this tactic not only deprived the opponent of his best defense, it also removed the shield-bearer from the fight as well. A good shield-bearer was a considerable asset in the hólmgang, for while he could not damage the other fighter himself (and we suppose the second himself was not a valid target either, although the sagas do not explicitly say this) an experienced second could catch the opponent's sword in his rickety shield, and by twisting the board trap or even bend the opponent's sword (Jones, "Characteristics", 214). Some sagas recount that the fighters had to repeatedly straighten their swords during the combat. Given this type of defensive tactic, it does not require a belief in the evil eye of the bersark explain why a fighter's sword would fail to "bite" the opponent! When the hólmgang began, the challenged party struck the first blow. His opponent then struck one, and so on back and forth, until the combat was decided. The development of hólmgang was a vital step in restricting bloodshed caused by dueling. First, the fighters were physically separated from onlookers and potential avengers, with the duel being located on an island, at a crossroads, or within a roped-off area. Secondly, the hólmgang was structured to halt fighting after first blood had been drawn, which was proven by the evidence of blood staining the cloaks beneath the duelists' feet. 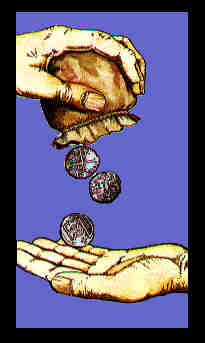 While outright killing of one's opponent was limited in hólmgang, a duelist got not only the satisfaction of facing his opponent at sword's point, but also received a monetary atonement in the form of the hólmlausn. Further, the loser in the duel, although wounded and defeated, had a chance to prove his manliness and bravery by standing to the challenge: alive and honor relatively intact, his relatives had no further cause for hostilities. The sword was often specifically named as the weapon to be used in the hólmgang, which limited severe wounds such as would he caused by the axes or "halberds" (hooking spears or pole axes) that occasionally appear as weapons in the duel, thus reducing the number of deaths. Lastly, even if death was the outcome of the hólmgang, the rules of combat specifically prohibited the relatives of the slain man from seeking compensation (Jones, "Characteristics," 217). Sacralization as a limiting method. While the rules of the hólmgang prohibited continuation of hostilities between families of duelers, the Scandinavian peoples of the Viking Age had no police force or military empowered to enforce laws or rules. Therefore, one of the ways of ensuring that the hólmgangulog was followed was by sacralizing the duel. By rituals such as the tiösnublót, and by the marking of the dueling site as a liminal area, the hólmgang was shown to participants and observers alike to be a sacred activity, and this in turn added weight to the hólmgangulog, making it more likely that the rules would be followed by all concerned, and that the families of the participants would not continue hostilities into a feuding situation. The hólm as a liminal area. While the location of the hólmgang tended to physically separate the combatants from any onlookers who might be caught up in hostilities, the placement of the duel on an island (hólm), at a cross-roads, or within a specially marked area hounded by hazel poles indicates that the area considered appropriate to the hólmgang was one which was already considered to be a special, restricted, or even holy area. The place where the court sat was a level plain and hazel poles were set in a circle on the plain linked by ropes. These were called the sanctuary ropes. Inside the circle sat the judges, twelve from the Fjordane District, twelve from the Sogn District, twelve from Hjordaland. These three twelves should judge the lawsuit. ( Egils saga Skallagrímssonar , 90). Alf the Shipman and his men ran to the court, cut apart the sanctuary ropes, and broke down the poles, driving away the judges. Then there was a real uproar in the assembly, but all the men there were without their weapons. Then Egil said, "Can Berg-Onund hear my words?" "I hear," he said. "Then I will challenge you to a duel, and we will fight it out here at the Assembly. Let him who wins have the property, both land and money. If you dare not be called coward by everyone." Then King Erik answered, "If you are eager to fight Egil, then we can let you have that." Egil answered, "I will not fight against you, nor against overwhelming odds, but I'll not run away from equal strength of men if this be allowed me, and in that case, I will make no distinction between opponents. " Then Arinbjorn said, "Let us go away. We can't do anything for the moment that will serve us." He turned away and all his men with him. Then Egil turned back and said, "I call you to witness, Arinbjorn, and you, Þord, and all those men who can now hear my words, nobleman, lawman, and everyone, that I lay a curse on all the estates which Bjorn has owned for living or for working. I lay a curse on you, Berg-Onund, and on all other men, native or foreign, noble or commoner, on every man who is involved in this. I name you breakers of the law of landrights, breakers of the peace, incurrers of the gods' anger." Then Egil went away with Arinbjorn ( Egils saga Skallagrímssonar , 92). Again, the holy grove is the opposite of the hólmgöngustaðir, where the holy ropes separate a frið-garð on one side, and the normal world of violence and weapons on the other. Since the law courts and cult places used the same method of delineating the frið-garð as did the hólmgang, the association with the rule of law and the judgment of the gods served to help limit violence arising from the duel by conceptually confining the conflict within the vébond. The weight of cultural expectations and religious belief helped prevent bystanders from becoming embroiled in the conflict. Pegs with heads were to be rammed in there [at the corners of the cloak] and these pegs were called tiösnur. He who attended to this was to approach the tiösnur in such fashion that he looked up between his legs while holding onto his earlobes and speaking the spell which later was used in the so-called tiösnu sacrifice ( Kormáks saga , 33). This peculiar action is difficult to understand, especially as the incantation which accompanied the act has not been transmitted to us. However, the unique posture of bending over and looking between one's legs while grasping the ears is familiar from elsewhere in the sagas, when this action is used to either cast the evil eye upon a victim or to break such a curse (see Vatnsdæla saga , ch. 26, Gull-Þóris saga , ch. 17, and Landnamábók III, 4; Ciklamini, "Old Icelandic Duel," 184). In the context of the hólmgang, it is suggested that this ritual serves an apotropaic function: the person performing the rite was a disinterested party, and the gazing through the legs in this manner put the person in a position to gain insight into the supernatural world, discovering and banishing evil magic which might unjustly affect the outcome of the duel. More specifically, the rite was probably designed to prevent the common magical spell attributed to the berserker which blunted an opponent's sword blade (Ciklamini, "Old Icelandic Duel," 184). "They went to the hólm. Þórvard gave the spæ-wife a bigger fee, and then he sacrificed." The battle follows this, and then Kormák sacrifices the blótnaut afterwards (see below) ( Kormáks saga , ch. 22; Jones, "Religious Aspects," 309-310). Whether or not animal sacrifice preceded the hólmgang, it certainly concluded the battle. One or both of the combatants was expected to bring to the hólmgang court a calf or bull which was called the blótnaut (sacrifice-bull) (Gould, "Blótnaut," 143-144). The victor of the battle sacrificed the blótnaut as a thank-offering to the gods for his victory, and also perhaps as part of the ritual which allowed the warrior to re-enter the Midgarð world of peace and human law (Jones, "Religious Aspects," 310). Hólmgang as evolution - differences from einvigi. The hólmgang served the community of the Scandinavians of the Viking Age in a vital way by helping to prevent widespread feud and bloodshed which could disrupt the functioning of an entire community. The various differences between hólmgang and einvigi can be seen as developments which foster maintenance of the social order. Einvigi was a no-holds barred form of combat where dishonorable tactics were allowable so long as they won the victory. Hólmgang brought with it the hólmgangulog, which regulated the fighting and by rule and force of custom limited the way the combat proceeded: in hólmgang "it was considered a disgrace to bite, kick or scratch: 'horses bite, mares kick and cats scratch -- but punching, walloping and hair-pulling is man's work' said a man from Bykle" (Bø, "Hólmganga and Einvigi," 145). More honorable combat that disdained "dirty tricks" was less likely to cause hard feelings for the defeated combatant and his kin, while the regulated nature of the hólmgang allowed for combat to first blood rather than to the death: when the defeated warrior was left alive, there was no need for his family to declare bloodfeud or seek vengeance against the winner of the battle. In einvigi, there were no rules regarding what roles bystanders or observers could take in regards to the battle, and the family of the defeated duelist was intimately involved with the victor afterwards either by the need to collect wergild or, in the more societally approved response, to exact vengeance, which involvement often escalated the conflict beyond the original two combatants. 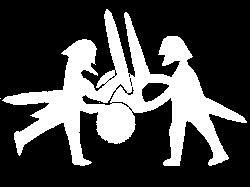 Hólmgang, on the other hand, defined set roles for those observing the combat, including shield-bearers, a person designated to offer the sacrifice of the blótnaut, and possibly others with official roles such as line judges to determine when a combatant overstepped the boundaries of the hólmgöngustaðir. Since the hólmgangulog regulated the conduct of the victor and the vanquished, prescribing that the vanquished warrior must pay hólmlausn (hólm-ransom) if still living and that the victor need pay limited atonement or no atonement/wergild if the defeated party was slain, the family of the defeated combatant was no longer expected or required by society to exact vengeance or payment for the slaying. Einvigi by its nature was unregulated: the combatants were not separated from any onlookers in any way, and the potential numbers of onlookers who could become embroiled in the passions of the conflict was unlimited. In the hólmgang, by physically removing the combatants to an island (hólm) or other limited area, there was physically less room and less opportunity for bystanders to become involved in the conflict. Furthermore, hólmgang combat took place in an area roped off and carefully demarcated, into which area no onlookers were allowed to enter, making it less likely for an angry observer to draw a weapon and enter the fray. The hólmgöngustaðir was conceptually separated from the onlookers as well by the force of ritual, law, custom, and holiness, creating deep psychological separation that further distanced the duelists from those watching the fight. Final Limitations - the Abolishment of Dueling in Scandinavia. While hólmgang was considered an act with sacred and legal force, it served well as an alternate recourse in law. The man who could not afford to pay sworn witnesses or compurgators to attest his case at the lawcourts of the Þing, or who was involved in legal wrangles with men who had much more social standing and power, were able to equalize the operation of law by resorting to the law of the duel, pitting himself and his skill at arms against an opponent who he could not defeat any other way. A man was called Ísólfr. He came to Iceland at the end of the Settlement period. He challenged Vilbaldr to hand over his land or fight a duel. Vilbaldr, however, did not wish to fight and left Búland ( Landnamábók , ch 372; Ciklamini, "Literary Mold," 122). The sagas are full of variations upon this theme. Most commonly the challenger is described as a bersark: fearsome warriors known for their rage and invincibility in battle (see my article on Berserkergang for more information on the bersark). While it is indisputable that this theme is in part a literary stereotype (the lust-crazed bersark who challenges a man in order to win sexual rights to the man's wife, daughters, or other female relatives and incidentally the defeated man's farm and worldly goods, is opposed by either the saga hero or the challenged man himself, who must overcome the bersark's supernatural ability to blunt sword blades with his glance and who can often only be wounded by trickery or a special weapon) (Blaney, "The Berserk Suitor," 279-294) the accounts from Landnamábók show that this theme had its roots in actual practice. If a man challenged another in any matter and the one who had issued the challenge won the victory, then his due as victor was whatever the challenge had been made for. If he were defeated, he was obliged to ransom himself by an agreed sum. But if he fell in the duel, the fight lost him all his possessions, and the one who had killed him in the duel inherited from him ( Egils saga Skallagrímssonar , 120). Ljótr is not an honorable man; he is inn mesti ójafnaðarmaðr, "a most violent and unscrupulous man." His quarrel over a trenched pasture which he shared with his neighbor typifies Ljótr's dealings with others and establishes him as a man who disregards the rights of others . . . the duels he fought were part of the violent pattern of his life (Ciklamini, "Literary Mold," 127-128). Þorkell . . . challenged Þangbrandr to a duel; Þangbrandr defended himself with a crucifix instead of a shield; but even so he managed to defeat Þorkell and kill him ( Njáls saga , 218). The Church in Western Europe at this time relied upon the duel as a participant in litigation: abbeys paid champions to represent them in judicial duels, and priests were found as combatants in duels as well (Ciklamini, "Icelandic Duel, 190). In fact, the Scandinavian countries all abolished the duel well before any other country in Western Europe, where the duel ultimately persisted until 12th and 13th century town charters abolished the use of the judicial duel, and in fact was not completely extirpated until the British Ashford scandal in 1818. This is not to say that once hólmgang was abolished, that good Christians would not find Christian reasons to abjure the practice, as we see in Ljósvetninga saga where Hrolf challenged Eyjolf to a duel, only to be told by a friend, "I strongly disapprove that hólmgang should be resorted to, and it is a custom of heathen men" (ca. 1058) (Jones, "Characteristics," 223-224). Hólmgang no longer serves the needs of society and its leaders. But the following day in the legislature it was made law that hólmgang should be done away with from that day forth forever. This was done on the advice of all the wisest men at the Þing, where indeed there were present the wisest men of all the land. So this which Hrafn and Gunnlaug fought was the last hólmgang to take place in Iceland ( Gunnlaugs saga Ormstungu , 207-208). The time was ripe in Iceland for the abolition of the hólmgang as a legal recourse. Two years before Hrafn and Gunnlaug's abortive battle, in 1004, the Icelandic Lögretta had established the Fifth Court as a court of appeals. Now instead of appealing a bad court decision to the duelling-ground, one could appeal the verdict to a higher court. While some duels were still fought sem forn lög liggja til, "according to the old laws," they no longer enjoyed social sanction. 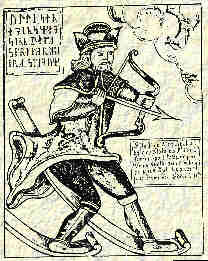 The tale of the formal legal abolishment of hólmgang is found in Ljósvetninga saga : although hólmgang had gradually fallen into disuse since the time of Hrafn and Gunnlaug, Þórir Helgason suddenly and unexpectedly challenged Guðmund the Mighty to a duel rather than continue his legal appeal. As with the British Ashford scandal in 1818, Þórir was using a forgotten but still legal maneuver to achieve his ends: the hólmgang was disapproved of, but not yet illegal. Belatedly, the Lögretta passed the law finally abolishing the hólmgang in Iceland (Jones, "Characteristics," 222). Before leaving Eirik summoned all his Landmen and the larger bondis to meet him. Eirik the jarl was an able ruler, and they had much discussion regarding the laws and their administration. It was considered a scandal in the land that pirates and berserks should be able to come into the country and challenge respectable people to the hólmgang for their money or their women, no wergild being paid whichever fell. Many had lost their money and been put to shame in this way; some indeed had lost their lives. For this reason jarl Eirik abolished all hólmgang in Norway and declared all robbers and berserks who disturbed the peace outlaws ( Grettis saga , ch. 19). Gunnlaugs saga Ormstungu suggests that the Norwegian ban on hólmgang was instead due to the same conflict between Gunnlaug and Hrafn which had supposedly ended in the abolition of hólmgang in Iceland: once the enemies were forbidden to duel in Iceland, they traveled to Norway, where the hólmgang was still legal. There Jarl Eiríkr forbade Gunnlaug permission to carry on with the duel (Gunnlaugs saga Ormstungu, 211). Saxo Grammaticus reports the abolishment of hólmgang in Denmark at two different dates. According to Saxo, Svein Forkbeard supposedly banned hólmgang after witnessing a successful ordeal by hot iron performed by Bishop Poppo. The second time hólmgang was banned in Denmark according to Saxo was in 1074 (a much more believable date) when Harald Hein declared that instead of hólmgang the final resort in a lawsuit was to be purgatorial oath: this law was not well received as a wealthy man could purchase compurgators to swear to his case, and deprived a litigant the right to disprove a false oath via trial by combat (Ciklamini, "Icelandic Duel," 192-193). Beowulf and the Fight at Finnsburgh . ed. Frederick Klaeber, 3d ed., Lexington MA: DC Heath & Co. 1950. Egils saga Skallagrímssonar . Christine Fell, trans. In: Egil's Saga . Toronto: University of Toronto Press, 1975. Droplaugarsona saga . M. H. Scargill and Margaret Schlauch, trans. In: Three Icelandic Sagas . Princeton: Princeton University Press. 1950. pp. 102-135. Gísla saga Súrsonnar . Ralph B. Allen, trans. In: The Saga of Gisli the Son of Sour . New York: Harcourt, Brace and Co. 1936. Grettis saga . Eiríkr Magnússon and William Morris, trans. In: The Story of Grettir the Strong . 1869; Repr. Totowa: Cooper Square Publishers. 1980. Grettis saga . Denton Fox and Hermann Pálsson, trans. Grettirs Saga . Toronto: University of Toronto Press. 1974. Gunnlaugs saga Ormstungu . Gwyn Jones, trans. In: Eirik the Red and Other Icelandic Sagas . London: Oxford University press. 1961. Paperback reissue 1999. Kormáks saga . Lee M. Hollander, trans. In: The Sagas of Kormák and the Sworn Brothers . Princeton: Princeton University Press. 1949. Kormáks saga . W. Collinew, trans. In: The Life and Death of Cormac the Skald . AMS Press. 1940. (Reprint). Njáls saga . Magnus Magnusson and Hermann Pálsson, trans. In: Njal's Saga . Harmondsworth: Penguin. 1960. Tacitus, P. Cornelius. Germania . In: Medieval Sourcebook: Tacitus's Germania in Latin . Paul Halsall, editor. ORB: The Online Reference Book for Medieval Studies. November 1998. (accessed 8/19/99). Tacitus, P. Cornelius. Germania . trans. H. Mattingly. In: The Agricola and the Germania of Tacitus . New York: Penguin. 1970. Bax, Marcel and Tineke Padmos. "Two Types of Verbal Dueling in Old Icelandic: the Interactional Structure of the senna and the mannjafnaðr in Harbarðsljoð ." Scandinavian Studies . 55 (1983) 149-174. Blaney, Benjamin. "The Berserk Suitor: The Literary Application of a Stereotyped Theme." Scandinavian Studies . 54 (1982) 279-294. Bø, Olav. "Hólmganga and Einvigi: Scandinavian Forms of the Duel." Medieval Scandinavia 2 (1969) 132-148. Byock, Jesse L. Feud in the Icelandic Saga . Berkeley: University of California Press. 1982. Byock, Jesse L. Medieval Iceland: Society, Sagas and Power . Berkeley: University of California Press. 1988. Reprint 1990. Ciklamini, Marlene. "The Literary Mold of the Hólmgongumaðr." Scandinavian Studies . 37:2 (1965) 117-138. Ciklamini, Marlene. "The Old Icelandic Duel." Scandinavian Studies . 35:3 (1963) 175-194. Clover, Carol J. "Hildigunr's Lament." Structure and Meaning in Old Norse Literature. eds. John Lindow, Lars Lönnroth, Gerd W. Weber. Odense: Odense University Press. 1986. pp. 141-183. Ellis-Davidson, Hilda R. The Sword in Anglo-Saxon England . Oxford: Oxford University Press. 1962. Reprint (paperback) 1998. Foote, Peter G. and David M. Wilson. The Viking Achievement . London: Sidgewick & Jackson, 1970. Gould, Chester N. "Blótnaut." Studies in Honor of Hermann Collitz Presented by a Group of his Pupils and Friends on the Occasion of his Seventy-Fifth Birthday, February 4, 1930 . Baltimore: Johns Hopkins press. 1930. pp. 141-154. Hastrup, Kirsten. Culture and History in Medieval Iceland: an Anthropological Analysis of Structure and Change . Oxford: Clarendon. 1985. Jones, Gwen. "Some Characteristics of the Icelandic Hólmganga." Journal of English and Germanic Philology 32 (1933) 203-224. Jones, Gwen. "The Religious Elements of the Icelandic Hólmganga." Modern Language Review . 27:3 (1932) 307-313. Lea, Henry Charles. The Duel and the Oath. ed. Edward Peters. University of Pennsylvania Press. 1974. Nylén, Erik. Stones, Ships and Symbols: The Picture Stones of Gotland from the Viking Age and Before . Stockholm: Gidlunds. 1988. Silkhair, Arnulf. "The Hólmgang." Tournaments Illuminated 7 (1968) 8-9.